No movies for me my first day of Sundance. There’s not many movies going on the first day. 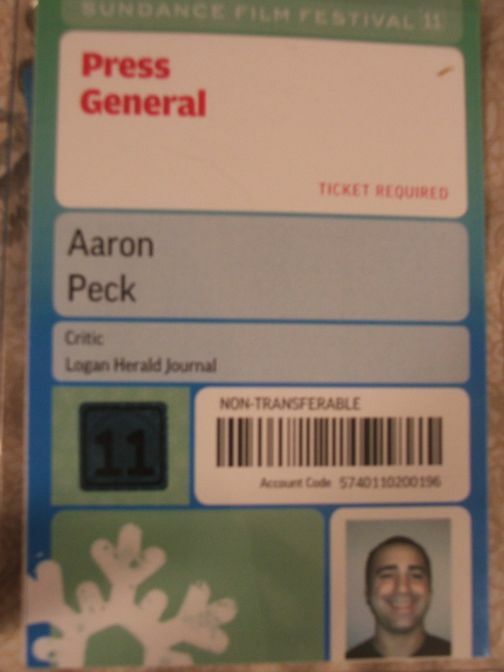 Instead I found my way to festival headquarters and picked up my press credentials. After that, as is my tradition every year, I purchased an official Sundance poster. That makes three posters now. The collection is steadily growing. At the press office I requested and received tickets for two public screenings. One for HERE, starring Ben Foster which I’ll be seeing tomorrow, and the other ticket is for My Idiot Brother, which I’ll be seeing the following day. My game plan for tomorrow is to get to the press office as early as possible, because I really want to request and get a ticket to the public screening of Kevin Smith’s new film Red State which premieres on the 23rd. There’s rumors that a Baptist church congregation is planning on picketing the festivities, and that Kevin Smith has called on people to picket the picketers. Needless to say there’s going to be some fun stuff going on, and I want to be there for it. Over the next nine days I have 26 movies scheduled. There are going to be some movies that I’ll have to move around or miss because of unforeseen reasons. That’s how it always goes at Sundance, you just got to roll with it. Over the next week or so I’ll be posting regular updates here on The Reel Place, about everything that is happening and about my own personal experience with the festival. Should be fun.